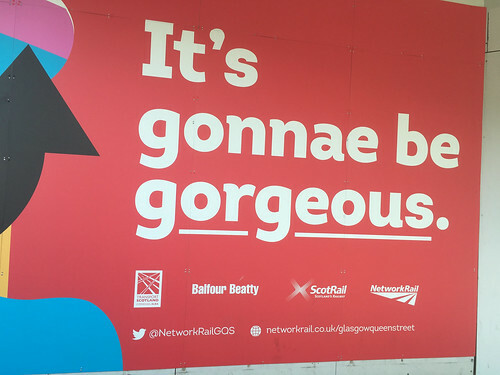 This information buird wis seen in Glesca an annoonces the upgrade tae Glesca Queen Street station. In Scots the words 'gauin tae' is affen cut doun tae 'gaunae' or here as 'gonnae'. The Inglis for gauin tae or gaunae is "going to." Sib tae this is the American Inglis 'gonna'. Photie taen bi Chris Third.